Thousands of ceramic poppies will go on display at St Magnus Cathedral, as part of this year’s commemoration of the Battle of Jutland. Poppies: Weeping Window, which will be at the cathedral from April 22 until June 12, is from the installation Blood Swept Lands and Seas of Red, on show at the Tower of London in 2014, where 888,246 poppies were displayed – one to honour every death in the British and Colonial forces of the First World War. 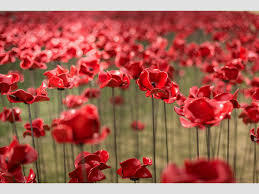 Weeping Window is the cascade of poppies that was seen pouring out of a high window down to the grass below. In Orkney, the poppies will cascade from the western end of the cathedral. We have had a lot of wind and rain this winter but the last few days have been bright and frosty. The days are lengthening and our cows are calving so we are hopeful that spring is on the way. The bookings are flowing in so it is time to sit down and plan your holidays. Orkney is a beautiful place to visit at any time of year but the spring and summer are the most popular times to visit. The wild flowers are amazing and the wildlife is spectacular. This photo was taken on 4th June when the sea pinks are in full bloom at Marwick Head in Birsay in the West Mainland of Orkney. You can also see Kitchener's Memorial. A tasteful cottage located in peaceful farmland with spectacular views. Only 3 miles from local amenities and many of the historical sites are within a 15 minute drive.